All types of food can be baked, but some require special care and protection from direct heat. Various techniques have been developed to provide this protection. In addition to bread, baking is used to prepare cakes, pastries, pies, tarts, quiches, cookies, scones, crackers, pretzels, and more. These popular items are known collectively as "baked goods," and are often sold at a bakery, which is a store that carries only baked goods, or at markets, grocery stores, farmers markets or through other venues. Meat, including cured meats, such as ham can also be baked, but baking is usually reserved for meatloaf, smaller cuts of whole meats, or whole meats that contain stuffing or coating such as bread crumbs or buttermilk batter. Some foods are surrounded with moisture during baking by placing a small amount of liquid (such as water or broth) in the bottom of a closed pan, and letting it steam up around the food, a method commonly known as braising or slow baking. Larger cuts prepared without stuffing or coating are more often roasted, which is a similar process, using higher temperatures and shorter cooking times. Roasting, however, is only suitable for finer cuts of meat, so other methods have been developed to make tougher meat cuts palatable after baking. One of these is the method known as en croûte (French for "in a pastry crust"), which protects the food from direct heat and seals the natural juices inside. Meat, poultry, game, fish or vegetables can be prepared by baking en croûte. Well-known examples include Beef Wellington, where the beef is encased in pastry before baking; pâté en croûte, where the terrine is encased in pastry before baking; and the Vietnamese variant, a meat-filled pastry called pâté chaud. The en croûte method also allows meat to be baked by burying it in the embers of a fire – a favorite method of cooking venison. Salt can also be used to make a protective crust that is not eaten. Another method of protecting food from the heat while it is baking is to cook it en papillote (French for "in parchment"). In this method, the food is covered by baking paper (or aluminium foil) to protect it while it is being baked. The cooked parcel of food is sometimes served unopened, allowing diners to discover the contents for themselves which adds an element of surprise. Eggs can also be used in baking to produce savoury or sweet dishes. In combination with dairy products especially cheese, they are often prepared as a dessert. For example, although a baked custard can be made using starch (in the form of flour, cornflour, arrowroot, or potato flour), the flavor of the dish is much more delicate if eggs are used as the thickening agent. Baked custards, such as crème caramel, are among the items that need protection from an oven's direct heat, and the bain-marie method serves this purpose. The cooking container is half submerged in water in another, larger one, so that the heat in the oven is more gently applied during the baking process. Baking a successful soufflé requires that the baking process be carefully controlled. The oven temperature must be absolutely even and the oven space not shared with another dish. These factors, along with the theatrical effect of an air-filled dessert, have given this baked food a reputation for being a culinary achievement. Similarly, a good baking technique (and a good oven) are also needed to create a baked Alaska because of the difficulty of baking hot meringue and cold ice cream at the same time. Baking can also be used to prepare other foods such as pizzas, baked potatoes, baked apples, baked beans, some casseroles and pasta dishes such as lasagne. The first evidence of baking occurred when humans took wild grass grains, soaked them in water, and mixed everything together, mashing it into a kind of slippery and wet broth-like paste. The paste was cooked by pouring it onto a flat, hot rock, resulting in a bread-like substance. Later, when humans mastered fire, the paste was roasted on hot embers, which made bread-making easier, as it could now be made any time fire was created. The world's oldest oven was discovered in Croatia in 2014 dating back 6500 years ago. 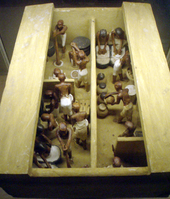 The Ancient Egyptians baked bread using yeast, which they had previously been using to brew beer. Bread baking began in Ancient Greece around 600 BC, leading to the invention of enclosed ovens. "Ovens and worktables have been discovered in archaeological digs from Turkey (Hacilar) to Palestine (Jericho) and date back to 5600 BC." Baking flourished during the Roman Empire. Beginning around 300 B.C., the pastry cook became an occupation for Romans (known as the pastillarium) and became a respected profession because pastries were considered decadent, and Romans loved festivity and celebration. Thus, pastries were often cooked especially for large banquets, and any pastry cook who could invent new types of tasty treats was highly prized. Around 1 AD, there were more than three hundred pastry chefs in Rome, and Cato wrote about how they created all sorts of diverse foods and flourished professionally and socially because of their creations. Cato speaks of an enormous number of breads including; libum (sacrificial cakes made with flour), placenta (groats and cress), spira (modern day flour pretzels), scibilata (tortes), savaillum (sweet cake), and globus apherica (fritters). A great selection of these, with many different variations, different ingredients, and varied patterns, were often found at banquets and dining halls. The Romans baked bread in an oven with its own chimney, and had mills to grind grain into flour. A bakers' guild was established in 168 B.C. in Rome. Eventually, the Roman art of baking became known throughout Europe and eventually spread to eastern parts of Asia. By the 13th century in London, commercial trading, including baking, had many regulations attached. In the case of food, they were designed to create a system "so there was little possibility of false measures, adulterated food or shoddy manufactures." There were by that time twenty regulations applying to bakers alone, including that every baker had to have "the impression of his seal" upon bread. Beginning in the 19th century, alternative leavening agents became more common, such as baking soda. Bakers often baked goods at home and then sold them in the streets. This scene was so common that Rembrandt, among others, painted a pastry chef selling pancakes in the streets of Germany, with children clamoring for a sample. In London, pastry chefs sold their goods from handcarts. This developed into a delivery system of baked goods to households and greatly increased demand as a result. In Paris, the first open-air café of baked goods was developed, and baking became an established art throughout the entire world. 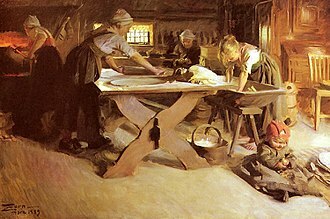 Every family used to prepare the bread for its own consumption, the trade of baking, not having yet taken shape. Baking eventually developed into a commercial industry using automated machinery which enabled more goods to be produced for widespread distribution. In the United States, the baking industry "was built on marketing methods used during feudal times and production techniques developed by the Romans." Some makers of snacks such as potato chips or crisps have produced baked versions of their snack products as an alternative to the usual cooking method of deep-frying in an attempt to reduce their calorie or fat content. Baking has opened up doors to businesses such as cake shops and factories where the baking process is done with larger amounts in large, open furnaces. The aroma and texture of baked goods as they come out of the oven are strongly appealing but is a quality that is quickly lost. Since the flavour and appeal largely depend on freshness, commercial producers have to compensate by using food additives as well as imaginative labeling. As more and more baked goods are purchased from commercial suppliers, producers try to capture that original appeal by adding the label "home-baked." Such attempts seek to make an emotional link to the remembered freshness of baked goods as well as to attach positive associations the purchaser has with the idea of "home" to the bought product. Freshness is such an important quality that restaurants, although they are commercial (and not domestic) preparers of food, bake their own products. For example, scones at The Ritz London Hotel "are not baked until early afternoon on the day they are to be served, to make sure they are as fresh as possible." Baking needs an enclosed space for heating – typically in an oven. The fuel can be supplied by wood, coal, gas, or electricity. Adding and removing items from an oven may be done by hand with an oven mitt or by a peel, a long handled tool specifically used for that purpose. Many commercial ovens are equipped with two heating elements: one for baking, using convection and thermal conduction to heat the food, and one for broiling or grilling, heating mainly by radiation. Another piece of equipment still used for baking is the Dutch oven. "Also called a bake kettle, bastable, bread oven, fire pan, bake oven kail pot, tin kitchen, roasting kitchen, doufeu (French: "gentle fire") or feu de compagne (French: "country oven") [it] originally replaced the cooking jack as the latest fireside cooking technology," combining "the convenience of pot-oven and hangover oven." 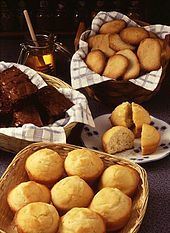 Asian cultures have adopted steam baskets to produce the effect of baking while reducing the amount of fat needed. Eleven events occur concurrently during baking, some of which (such as starch gelatinization) would not occur at room temperature. The dry heat of baking changes the form of starches in the food and causes its outer surfaces to brown, giving it an attractive appearance and taste. The browning is caused by caramelization of sugars and the Maillard reaction. Maillard browning occurs when "sugars break down in the presence of proteins. Because foods contain many different types of sugars and proteins, Maillard browning contributes to the flavour of a wide range of foods, including nuts, roast beef and baked bread." The moisture is never entirely "sealed in"; over time, an item being baked will become dry. This is often an advantage, especially in situations where drying is the desired outcome, like drying herbs or roasting certain types of vegetables. The baking process does not require any fat to be used to cook in an oven. When baking, consideration must be given to the amount of fat that is contained in the food item. Higher levels of fat such as margarine, butter, lard, or vegetable shortening will cause an item to spread out during the baking process. With the passage of time, breads harden and become stale. This is not primarily due to moisture being lost from the baked products, but more a reorganization of the way in which the water and starch are associated over time. This process is similar to recrystallization and is promoted by storage at cool temperatures, such as in a domestic refrigerator or freezer. 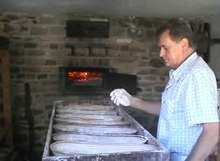 Baking, especially of bread, holds special significance for many cultures. It is such a fundamental part of everyday food consumption that the children's nursery rhyme Pat-a-cake, pat-a-cake, baker's man takes baking as its subject. Baked goods are normally served at all kinds of parties and special attention is given to their quality at formal events. They are also one of the main components of a tea party, including at nursery teas and high teas, a tradition which started in Victorian Britain, reportedly when Anna Russell, Duchess of Bedford "grew tired of the sinking feeling which afflicted her every afternoon round 4 o'clock ... In 1840, she plucked up courage and asked for a tray of tea, bread and butter, and cake to be brought to her room. Once she had formed the habit she found she could not break it, so spread it among her friends instead. As the century progressed, afternoon tea became increasingly elaborate." Benedictine Sisters of the Benedectine Monastery of Caltanissetta producing the crocette, they used to be prepared for the Holy Crucifix festivity. This was situated next to the Church of the Holy Cross, from which the sweets take the name. For Jews, Matzo is a baked product of considerable religious and ritual significance. Baked matzah bread can be ground up and used in other dishes, such as Gefilte fish, and baked again. For Christians, bread has to be baked to be used as an essential component of the sacrament of the Eucharist. In the Eastern Christian tradition, baked bread in the form of birds is given to children to carry to the fields in a spring ceremony that celebrates the Forty Martyrs of Sebaste. ^ "60 Baking Recipes We Stole From Grandma". Taste of Home. Retrieved 2018-10-19. ^ Pfister, Fred. 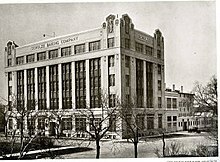 "Pfister Consulting: History of Baking – How Did It All Start? Yes people". Archived from the original on 3 February 2013. Retrieved January 1, 2013. ^ a b c d Morgan, James (2012). Culinary Creation. Routledge. pp. 297–298. ISBN 978-1-136-41270-7. ^ Rochelle, Jay Cooper (2001). Bread for the Wilderness: Baking As Spiritual Craft. Fairfax, VA: Xulon Press. p. 32. ISBN 1-931232-52-0. ^ Peter Ackroyd (2003). London: the biography (1st Anchor Books ed.). New York: Anchor books. p. 59. ISBN 0385497717. ^ Beeton, Mrs (1861). Mrs Beeton's Book of Household Management (Facsimile edition, 1968 ed.). London: S.O. Beeton, 18 Bouverie St. E.C. p. 831. ISBN 0-224-61473-8. ^ Simpson, Helen (1986). The London Ritz Book of Afternoon Tea - The Art & Pleasures of Taking Tea. London, UK: Angus & Robertson, Publishers. p. 8. ISBN 0-207-15415-5. ^ Snodgrass, Mary Ellen (2004). Encyclopedia of Kitchen History,. Taylor & Francis Books. p. 330. ISBN 0-203-31917-6. ^ "Chinese steamed sponge cake (ji dan gao)". Chinese Grandma. 8 February 2013. Retrieved 14 October 2015. ^ Figoni 2011, p. 38. ^ Figoni 2011, ch.3 pp.38 ff. ^ Figoni 2011, p. 42. ^ Simpson, Helen (1986). The London Ritz Book of Afternoon Tea: The Art & Pleasures of Making Tea. London: Angus & Robertson Publishers. p. 16. ISBN 0-207-15415-5. Pyler, E.J. ; Gorton, L.A. (2008). Baking Science & Technology (PDF). Sosland Publishing Company. ISBN 978-0-9820239-0-7.